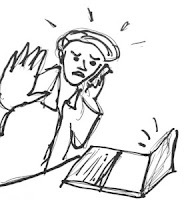 Several authors have advocated blocking time during you workday for working uninterruptedly. Amabile & Kramer (2011) say, on the basis of their research, that this is a condition for making progress in what is meaningful to you. Newport (2016) claims that working long and focused without interruptions leads to a dramatic increase in productivity and work satisfaction. 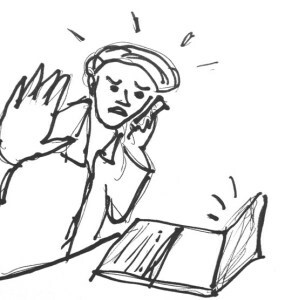 Research by Sophie Leroy has shown that when you pick up a task again after an interruption there will be what she calls an attention residue. This means that part of your mental energy is still focused on what you were doing during the interruption. The interruption harms your deep focus. Foroughi et al. (2014) examined what the influence of interruptions on the quality of work is. They had 54 students write an essay. There were three conditions in their experiment. Participant in condition 1 were interrupted while making an outline of the essay. Participants in condition 2 were interrupted while writing the essay. Participants in condition 3 were not interrupted. The experiment was conducted twice. In the first experiment all participants got 12 minutes to make an outline and 12 minutes to write the essay. The second time participants got 20 minutes for both activities. Both times the quality of the essays in condition 1 and 2 was significantly worse than in condition 3 although all participants had had equal time. People who had been interrupted while writing also wrote fewer words. This was not the case for people who had been interrupted while making an outline. How is this knowledge applicable? There are more and more indications that interruptions during work undermine both concentration and quality of the work. How may we use this knowledge? First, we can follow Amabile's and Newport's suggestions. We can benefit from creating work circumstances in which we can work uninterruptedly. Second, we can try as much as we can to not interrupt other when they are working. Third, as managers, we learn to think differently about how we structure and organize work and about what we expect from employees. If we want people do do good and creative work we must create the circumstances in which they can focus deeply. To this end we must help them to minimize interruptions.